These gluten-free flatbreads are easy to throw together and can be frozen in batches. Serve with your choice of topping (each topping is enough for four flatbreads). Each flatbread provides 123 kcal, 6g protein, 15g carbohydrate (of which 0.8g sugars), 4.5g fat (of which 2.5g saturates), 4.5g fibre and 0.3g salt. A portion of the roasted vegetable topping provides 52 kcal, 1.5g protein, 2.5g carbohydrate (of which 2.5g sugars), 4.5g fat (of which 2.5g saturates), 2g fibre and 0g salt. A portion of the garlic mushroom topping provides 46 kcal, 2g protein, 0.2g carbohydrate (of which 0.1g sugars), 4g fat (of which 2g saturates), 1g fibre and 0.1g salt. A portion of the avocado and smoked salmon topping provides 181 kcal, 13g protein, 1.1g carbohydrate (of which 0.6g sugars), 14g fat (of which 3g saturates), 2g fibre and 1.6g salt. For the flatbreads, place the flour in a mixing bowl and season with salt and pepper. Make a well in the centre of the flour and gradually pour in 400ml/14fl oz cold water in a thin stream, whisking continuously, until smooth and well combined as a thick batter. Set aside for at least 30 minutes, or preferably overnight, at room temperature, to allow the gram flour to fully absorb the water. Add a little coconut oil or ghee to a cast-iron or ceramic frying pan, smear it all over the base, then heat on a medium to high heat. When the pan is hot, add 4 tablespoons of the flatbread batter to the pan, swirling it until the flatbread is 10-12cm/4-5in wide and 2mm thick. Cook like a traditional pancake for 1-2 minutes, then flip and continue to cook on the other side until crisp and golden-brown on both sides. Repeat the process with the remaining flatbread batter. For the roasted vegetable topping, preheat the oven to 220C/200C Fan/Gas 7. Arrange the vegetables in a large roasting tray in a single layer, then sprinkle over the cumin seeds and season with salt and pepper. Dot the vegetables with the ghee. Roast for 30-40 minutes, turning halfway through the cooking time, until tender. For the garlic mushroom topping, preheat the grill to its highest setting. Melt the ghee in a frying pan over a medium heat. Add the mushrooms and fry for 4-5 minutes, adding the garlic and thyme during the last minute of cooking. Season with salt and pepper. Spread the garlic mushroom mixture over the flatbreads and sprinkle over the grated cheese. Place the flatbreads onto a baking tray. Grill for 1-2 minutes, or until the cheese has melted and is bubbling. 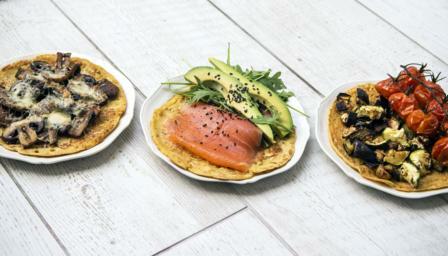 For the avocado and salmon topping, top the flatbreads with layers of the avocado slices, smoked salmon and rocket leaves. Sprinkle over the sesame seeds and lemon. Season with salt and freshly pepper.